Context: Different techniques are used for periodontal therapy, viz. scaling and root planing, subgingival curettage, gingivectomy, and full- or split-thickness flap procedures with or without osseous recontouring. Most of the said periodontal surgeries are invasive and associated with pain and secondary discomfort, thus leading to a quest for newer techniques such as laser-assisted closed pocket debridement techniques for periodontal therapy. The present study was designed to compare the efficacy of closed pocket debridement with diode laser and periodontal open flap debridement as assessed by clinical and microbiological parameters. Materials and Methods: Twenty patients in an age range of 20–54 years and with pocket depth of ≥5 mm and ≤7 mm were included in the study. The plaque index (PI), gingival index (GI), probing depth (PD), clinical attachment level (CAL), and colony forming units (CFUs) of the periodontal pathogens namely Porphyromonas gingivalis, Fusobacterium nucleatum, Aggregatibacter actinomycetemcomitans, and streptococci were compared in patients undergoing closed pocket debridement with diode laser (Group I) against open flap debridement (Group II) at baseline and after 3 months of the procedure. Results: There was a statistically significant difference between the PD reduction in Group I and Group II (P = 0.02), with Group II showing greater reduction in PD. Furthermore, the mean value of CFUs after 3 months of the procedures in Group I was significantly less as compared to Group II. Conclusion: The laser-treated group (Group I) was found to be better in terms of decrease in clinical PD as compared to Group II. The bactericidal effect of the diode laser was, also, clearly evident by a greater reduction of CFUs of periodontal pathogens in Group I as compared to Group II. Periodontal therapy is directed at disease prevention, slowing or arresting disease progression, regeneration of lost periodontal tissues, and maintaining the achieved therapeutic objectives. 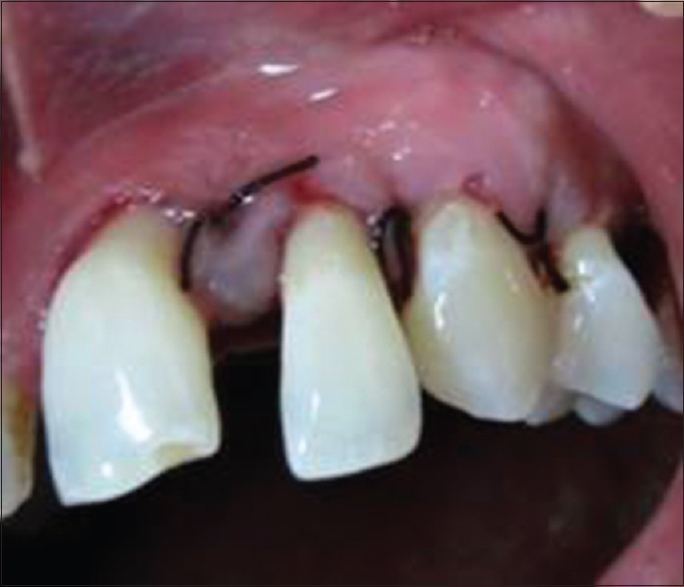 Conventional periodontal surgeries result in reduced pocket depth due to apical repositioning of the gingival margin exposing the root surface to the oral cavity, thus resulting in possible clinical attachment loss, gingival cratering, and recession. The pain and discomfort associated with periodontal surgeries have urged a research interest into laser-assisted periodontal therapy.,, From the end of the twentieth century and until now, there has been continuous upsurge in the development of laser-based devices. “LASER” is an acronym for Light Amplification by Stimulated Emission of Radiation. The physical principle of laser was developed from Einstein's theories in the early 1900s. The first device was introduced in 1960 by Maiman. Laser-assisted periodontal therapy is based on the concept of subgingival curettage and/or reattachment and regeneration of the attachment apparatus and is commonly referred to as “nonsurgical.”, Higher patient comfort and acceptance have been reported with laser-assisted periodontal therapy. 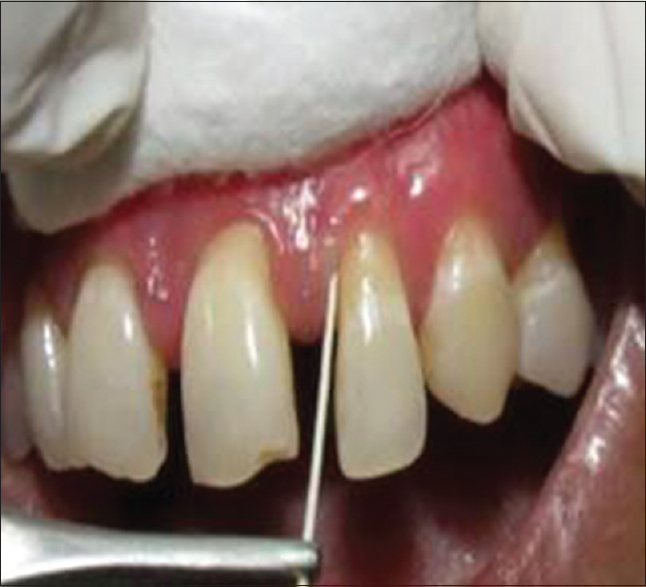 Laser-assisted periodontal therapy eliminates pockets with minimal recession or repositioning of the gingival margin. Laser-assisted periodontal therapy allows for selective removal of the sulcular or pocket epithelium re-defining the tissue margins, preserving the integrity of the mucosa, and aids in maintaining the free gingival crest. The advantages of lasers include better accessibility into periodontal pockets due to their thin and flexible fibers, hemostasis, less postoperative discomfort including pain and swelling, significant reduction in the bacterial counts at the surgical site, lack of need for suturing, and faster healing., The ideal properties of a laser that can be used successfully for periodontal pocket therapy are that it should be bactericidal, easy to deliver into the pocket, and safe enough to be used in a periodontal pocket so that it causes no harm to the root surface. Diode and Nd: YAG lasers have been used mainly for laser-assisted subgingival curettage and disinfection of the periodontal pocket with various degrees of success. Diode laser is an excellent soft-tissue laser and is available in smaller, cost-effective units. The radiation of diode laser shows greater absorption and less penetration than does Nd: YAG laser, especially in blood-rich tissues. Therefore, collateral damage with diode lasers is less than with Nd: YAG or CO2 lasers. The diode laser is a solid-state semiconductor laser that typically uses a combination of gallium (Ga), arsenide (Ar), and other elements such as aluminum (Al) and indium (In) to change electrical energy into light energy. The wavelength range is about 800–980 nm. The laser is emitted in continuous-wave and gated-pulsed modes and is usually operated in a contact method using a flexible fiber optic delivery system. Laser energy at 800–980 nm is poorly absorbed in water but highly absorbed in hemoglobin and other pigments. Since the diode laser basically does not interact with dental hard tissues, this type of laser is an excellent soft-tissue surgical laser, indicated for cutting and coagulating gingival and oral mucosal tissues and for carrying out soft-tissue curettage or sulcular debridement. Periodontal disease is a chronic inflammatory disease caused by bacterial infection. The bactericidal and detoxifying effect of diode laser treatment is an additional advantage of these lasers in periodontal therapy. Moreover, there is a significant suppression of Porphyromonas gingivalis (P.g. ), Fusobacterium nucleatum (F.n. ), Aggregatibacter actinomycetemcomitans (A.a.), and streptococci, which are the primary components of periodontal infections. A.a. invades the adjacent soft tissues making it difficult to be removed by mechanical periodontal treatment, while diode laser allows for selective removal of sulcular or pocket epithelium. It has a bactericidal effect due to its affinity toward pigmented periodontal pathogenic bacteria. The Food and Drug Administration approved oral soft-tissue surgery in 1995 and sulcular debridement in 1998 by means of a diode laser (Ga-Al-As 810 nm). Diode laser reduces patient discomfort, trauma, and postoperative complications. The present study was designed to compare the efficacy of closed pocket debridement with diode laser and periodontal open flap debridement as assessed by clinical and microbiological parameters. 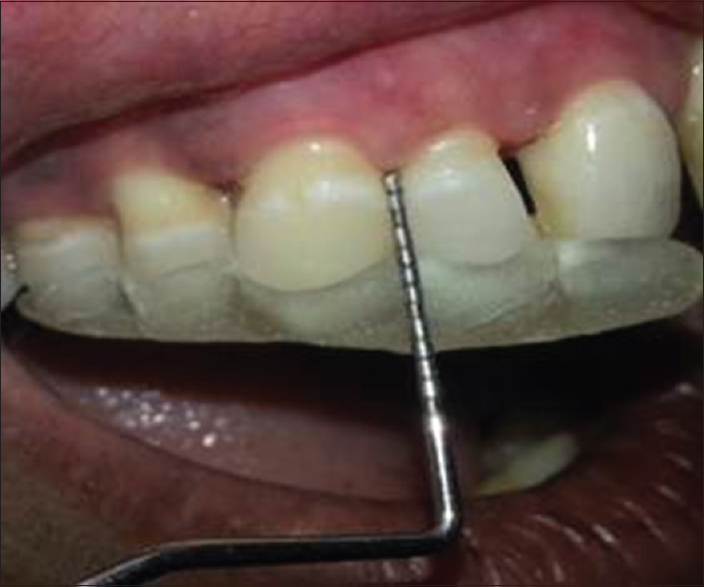 The present randomized, comparative, split-mouth controlled clinical trial was carried out to compare and evaluate the plaque index (PI), gingival index (GI), probing depth (PD), and clinical attachment level (CAL) before and after closed pocket debridement with diode laser and periodontal open flap debridement. 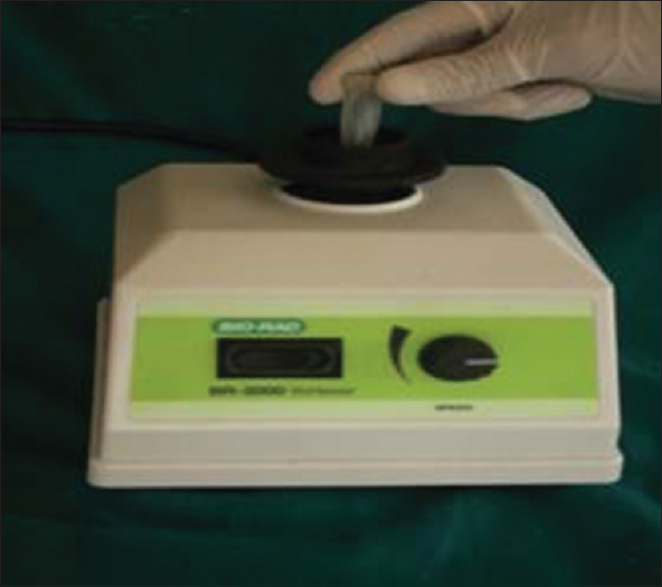 In addition, a microbiological study was conducted to evaluate the bactericidal effect of diode lasers as compared to the conventional open flap debridement procedure as evaluated at baseline and after 3 months of the procedures. Twenty patients were selected from the outpatient department. The study was approved by the Institutional Ethics Committee and carried out in accordance with the Declaration of Helsinki of 1975 as revised in 2000. The details of the study were explained to the patients, and written informed consent was taken from all for the same. Systemically healthy patients in the age group of 20–54 years with probing depth of ≥5 mm and ≤7 mm at a minimum of two sites in single-rooted teeth with horizontal bone loss and with an ability to maintain good oral hygiene compliance were included in the study, while patients who smoked or used smokeless tobacco, patients who were with a history of administration of antibiotics 3 months before the first visit, pregnant and lactating females, and patients with vertical intra-bony defects and who had undergone periodontal treatment in the past were excluded. The selected patients were randomly distributed into two groups: closed pocket debridement with diode laser group (Group I) and open flap debridement group (Group II). All the patients underwent Phase I therapy and were recalled for the evaluation after 4 weeks. Patients with persistent probing pocket depth 5–7 mm were selected. Since this was a split-mouth study, patients with bilateral periodontal pockets in the anterior sextant of either maxilla or mandible were selected for inclusion into the study. The measurements taken at this stage were considered as the baseline measurements. The study models were prepared for all the patients after Phase I therapy. Customized acrylic stents were prepared on them in the areas of interest. Grooves were prepared in the stents with the help of a bur at the site of maximum probing depth in an occluso-apical direction. Stents were prepared to standardize the probing angulations and the reference points [Figure 1] and [Figure 2]. 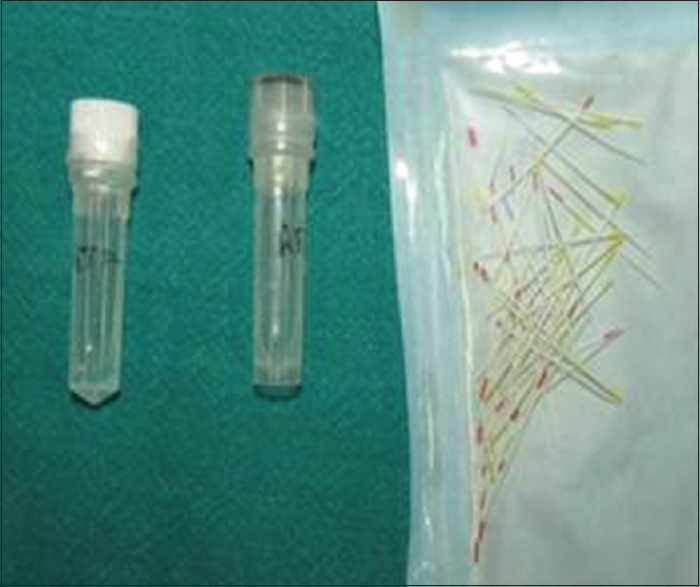 The same stent was used for the follow-up measurements after 3 months of the procedures [Figure 3] and [Figure 4]. Subgingival plaque samples were collected from the deepest pocket areas in both the groups with the help of paper points at baseline [Figure 5] and [Figure 6] and after 3 months of the procedures [Figure 7] and [Figure 8]. The area was isolated with sterile gauze and dried with a three-way air spray to avoid contamination with saliva. Supragingival plaque, if any, was removed with a sterile curette to ensure the collection of subgingival microbial flora in the collected plaque samples. The plaque samples were transported in reduced transport fluid containing cysteine hydrochloride and sodium thioglycolate as reducing agents [Figure 9] and then incubated in anaerobic jar [Figure 10]. 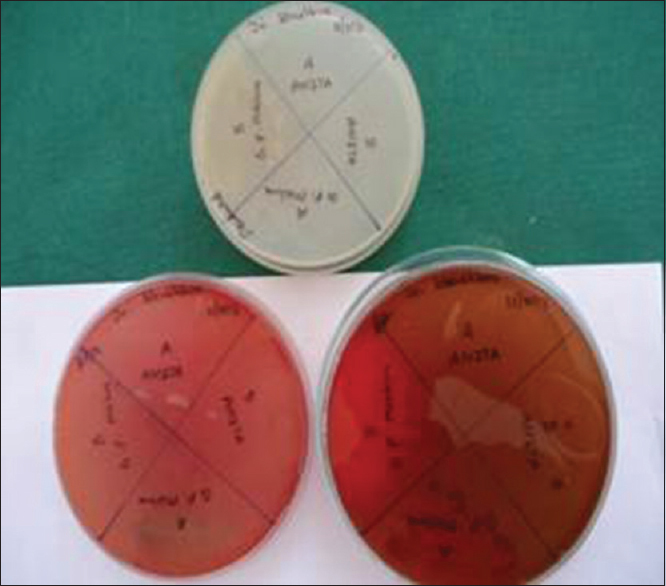 Media used for culturing were kanamycin blood agar with hemin and Vitamin K for P.g., kanamycin and vancomycin blood agar with hemin and Vitamin K for F.n., while dentaid for A.a. [Figure 11]. 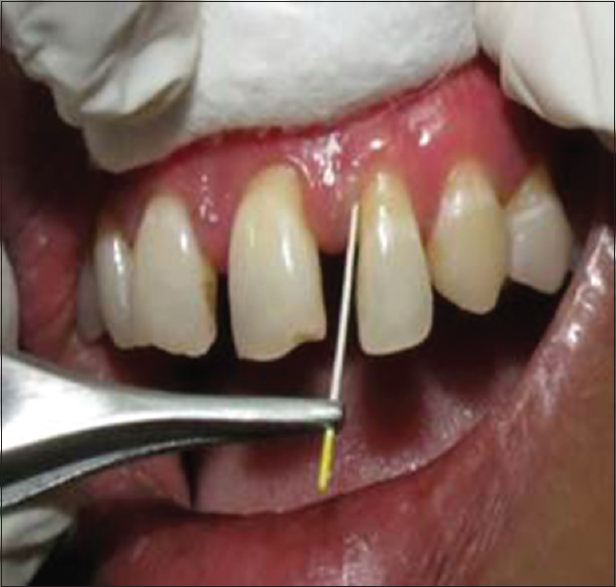 In Group I, diode laser-assisted periodontal pocket therapy without local anesthesia was carried out. The patients and all operatory personnel were made to wear protective laser eyewear. A power setting of up to 1.5 W was used in a continuous, contact mode with the help of flexible fiber optic delivery system and inserted into the sulcus to the base of the pocket [Figure 12]. The laser tip was, then, withdrawn 1 mm from the base and activated as this measurement allows for the laser energy to penetrate the tissues and reduce the bacterial load without the fiber touching the epithelial attachment at the bottom of the pockets. The tip was moved apicocoronally (vertically) and mesiodistally (horizontally) at sweeping motions in the pockets. The tip was angled so that the energy was directed parallel to the root surfaces and toward the inner epithelial lining of the sulci. The tip was kept constantly moving inside the pocket. The objective was to remove the epithelial lining of the pockets. Each pocket was lazed for a time span of 60 s. Following lasing of the pockets, any visible deposits on the root surfaces were removed using hand instruments. The area was, then, irrigated with sterile saline. The gingival tissues were compressed against the root surfaces to close the pocket and to aid in the formation and stabilization of fibrin clot. No sutures or periodontal dressings were given. A second and a third cycle of lasing were repeated with similar settings every 3rd day. This was attempted with the consideration of delaying the epithelial downgrowth and promoting regeneration of the periodontal tissues as it has been observed that during the healing phase, migration of the epithelium begins from the existing epithelium of attached gingiva and new epithelium begins to cover the exposed gingival corium within 2–3 days. Furthermore, formation and organization of connective tissue fibers take place during the healing phase and these fibers although somewhat immature in arrangement and width appear well organized in about 10–14 days. In Group II, the area to undergo surgery was anaesthetized with 2% lignocaine hydrochloride solution with adrenaline in a concentration of 1:80,000. Intracrevicular incisions were given and the flaps were reflected [Figure 13]. The granulation tissue was removed, and the roots were thoroughly scaled and planed with curettes. The sites were, then, sutured with simple interrupted sutures [Figure 14]. Patients were given routine postoperative instructions. All the patients were prescribed nonsteroidal anti-inflammatory agent (ibuprofen 400 mg three times a day for 3 days). Antibiotics were not prescribed as they would have altered the flora and modified the effect of diode lasers. Oral hygiene instructions were reinforced. Patients were asked to use chlorhexidine gluconate (0.2%) rinse twice a day for 15 days. Patients were recalled after a period of 1 week for suture removal. Patients were kept on a maintenance protocol and were recalled every month for the reinforcement of oral hygiene instructions. After 3 months of the procedures, PI, GI, probing depth (PD), and CAL were measured with the similar stents [Figure 13] and [Figure 14]. The entire data were entered into the Microsoft Excel sheet before it was statistically analyzed in Statistical Package for the Social Sciences (SPSS). Statistical analysis was done using IBM SPSS Statistics 20 Core system software (Chicago, IL, USA). The statistical significance of difference of several periodontal indices studied between the two study groups was tested using independent t-test. Within the study groups, statistical significance of difference of preoperative (0th day) and postoperative (90th day) indices was tested using paired t-test. P < 0.05 was considered statistically significant. 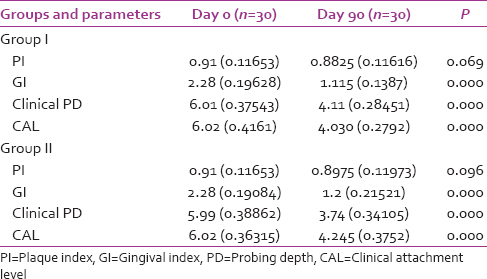 The mean values for PI, GI, PD, and CAL at the baseline and at 3 months posttreatment of the two groups are shown in [Table 1]. The PI values were found to be 0.91 ± 0.11 for Group I and 0.91 ± 0.11 for Group II at the baseline while 0.88 ± 0.11 for Group I and 0.89 ± 0.11 for Group II after 3 months of the procedures, and the difference was not found to be statistically significant. The GI decreased from 2.28 ± 0.19 to 1.11 ± 0.13 in Group I and from 2.28 ± 0.19 to 1.2 ± 0.21 in Group II after 3 months of the procedures, and the difference was found to be statistically significant (P = 0.000). There was reduction in PD at baseline from 6.01 ± 0.37 mm to 4.11 ± 0.28 mm in Group I and from 5.99 ± 0.39 mm to 3.74 ± 0.38 mm in Group II, and the difference was also found to be statistically significant for both the groups (P = 0.000). The mean CAL was found to be 6.02 ± 0.41 mm and 6.02 ± 0.36 mm for Group I and Group II at baseline while 4.03 ± 0.27 mm and 4.24 ± 0.37 mm for Group I and Group II, respectively, after 3 months of the procedures. The mean CAL showed statistically significant gain in CAL compared to baseline in both the groups (P = 0.000). [Table 2] shows mean values of colony forming units (CFUs) at baseline and after 3 months of the procedures for Group I and Group II. 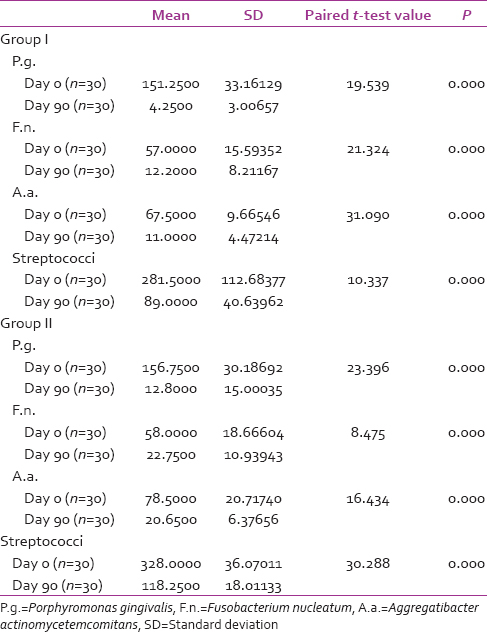 The mean CFU of periodontal pathogens P.g., F.n., A.a., and streptococci in both the groups showed statistically significant decrease from baseline to after 3 months of the procedures with the P = 0.000. The comparison of mean values of PI, GI, PD, and relative CAL in Group I and Group II is demonstrated in [Table 3]. The difference in PI as well as GI between Group I and Group II after 3 months of the procedures was not found to be statistically significant (P = 0.353 and 0.25, respectively) although there was a statistically significant difference between the PD reduction in Group I and Group II (P = 0.02), with Group II showing greater reduction in PD. There was no statistically significant difference in gain in CAL between Group I and Group II after 3 months of the procedures also (P = 0.115). [Table 4] demonstrates the comparisons in the mean values of CFUs in Group I and Group II. The mean value of CFUs after 3 months of the procedures in Group I was significantly less compared to Group II, with P value for P.g. being 0.017, for F.n. being 0.001, for A.a. being 0.000, and for streptococci being 0.006. Among the various techniques used for periodontal therapy, laser-assisted periodontal therapy has emerged as a novel technique in periodontal use. Nonsurgical laser pocket therapy offers several advantages over conventional surgical procedures including no need of analgesia, lesser mechanical trauma, lesser postoperative complications in the form of pain and swelling, being a minimally invasive procedure with greater patient compliance, lesser procedural time, minimal bleeding, and additional antimicrobial effect. Laser-assisted periodontal therapy allows for selective removal of sulcular or pocket epithelium preserving the connective tissues. It can be associated with cementum-mediated new connective tissue attachment and apparent periodontal regeneration on previously diseased root surfaces. Soft-tissue lasers such as diode and Nd: YAG lasers have the potential for curettage of pocket wall and disinfection of the periodontal pockets. Diode laser is the most widely used laser which is much cheaper compared to the conventional Nd:YAG lasers. The safety, bactericidal effect, and easy accessibility into pockets make lasers including diode the most ideal for periodontal therapy. Furthermore, numerous studies have identified diode lasers as an appropriate therapeutic tool for nonsurgical periodontal therapy due to their high absorption and less penetration properties. Moritz et al., in their studies, suggested that irradiation with diode lasers at a wavelength of 805 nm facilitates bacterial elimination from the periodontal pockets. Studies have also shown that diode lasers remove epithelium effectively without damaging the underlying connective tissues. The clinical parameters used in the present study included the PI and GI apart from the probing depth (PD) and CAL. The PI used was Turesky–Gilmore–Glickman Modification of Quigley–Hein PI as devised in 1970. The said index was used as it has a more objective definition of scoring because of use of disclosing agent (basic fuchsin) to identify the plaque and more objective definition of each numerical score. Further, repeated evaluation of plaque scores can be seen as tool to monitor patient compliance. The GI used was as devised by Loe and Silness in 1963. The said index has validity, reliability, and ease of use and also demonstrates sufficient sensitivity to distinguish between groups of mild and severe gingivitis. Further, it gives a quantitative assessment of bleeding scores which is more important for research and clinical trials than dichotomous index of presence or absence of bleeding. Pocket is an important clinical feature of periodontitis, so measure of pocket depth becomes important in the evaluation of progression or regression of the disease posttreatment. However, pocket depth depends on the position of gingival margin; its position may change with change in the level of gingival margin without giving actual gain in attachment. Thus, level of attachment which is the distance from a fixed point on crown to the base of the pocket is a better indicator of periodontal destruction. The microbiologic analysis was undertaken to analyze the antimicrobial effects of diode lasers. It was done by bacterial culture technique. The bacterial culture aimed at characterization of subgingival microflora which is still considered the gold standard of microbial assay techniques. P.g., F.n., A.a., and streptococci are the most common periodontal pathogens. Hence, the said microorganisms were evaluated. The present study was a split-mouth study which included 20 patients with chronic generalized periodontitis. Treatment was carried out in the anterior single-rooted teeth of either maxilla or mandible. In Group I, diode laser was used for closed pocket debridement while Group II consisted of conventional open flap debridement. All patients were subjected to initial preparation which consisted of full-mouth scaling and root planing as this allowed for optimal tissue health and plaque control, thereby enhancing the treatment outcomes. All measurements were taken with a manually calibrated UNC-15 periodontal probe. Before treatment, a customized acrylic stent was fabricated on the study cast for each patient. The stent was grooved in an occluso-apical direction. This was done to minimize change in the direction of probing at subsequent recordings. All these measurements were made from a fixed reference point on the stent in accordance with the study by Schwarz et al. For the test site, laser-assisted pocket therapy was performed without the application of local anesthesia as pain experience during laser therapy for periodontal procedures is negligible and does not require the use of anesthetics and results in minimal bleeding. A power setting of up to 1.5 W was used in a continuous, contact mode with the help of a flexible fiber optic delivery system and inserted into the sulcus to the base of the pocket. The laser tip was, then, withdrawn 1 mm from the base and activated as this measurement allows for the laser energy to penetrate the tissues and to reduce the bacterial load without the fiber touching the epithelial attachment at the bottom of the pocket. 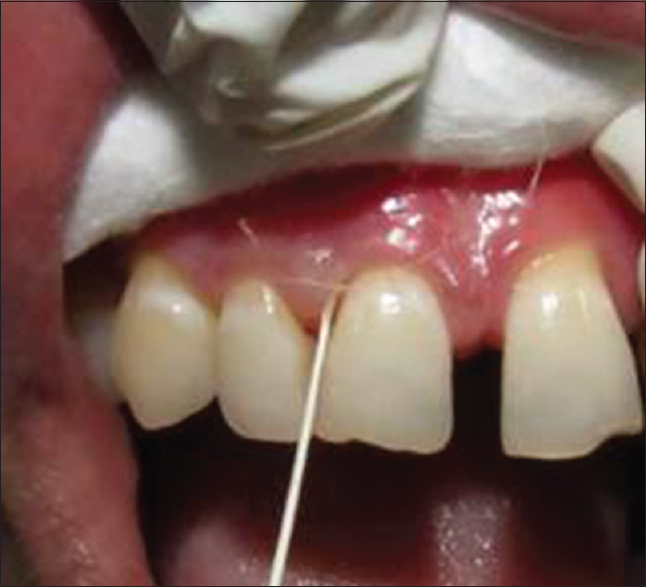 After completion of the laser-assisted pocket therapy, no sutures or periodontal dressings were given. Postoperatively, no antibiotics and analgesics were prescribed. A second and a third cycle of lasing were done at every 3rd day in an attempt to delay epithelial downgrowth and promote periodontal tissue regeneration as, according to Goldman et al., during the healing phase, migration of the epithelium begins from the existing epithelium of the attached gingiva and new epithelium begins to cover the exposed gingival corium within 2–3 days. Furthermore, formation and organization of connective tissue fibers take place during healing, and these fibers, although somewhat immature in arrangement and width, appear well organized in about 10–14 days. In light of this, lasing was not done beyond three cycles to prevent any inadvertent damage to the healing connective tissue fibers within the pocket. Furthermore, the sulcus heals from the bottom up and hence, during the second and the third lasing, the tip was placed 2 mm less than the pocket probing depth of the treatment site to allow healing at the floor of the pocket. Reprobing treatment sites was not attempted before 3 months as tissue reattachment to the root surface could have been damaged with a probe delaying the healing process. In Group II, conventional surgical procedure was followed with Kirkland flap. 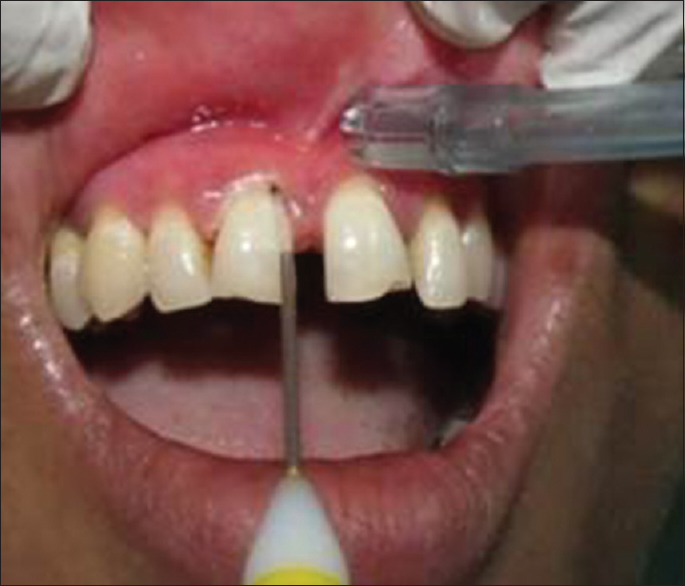 This technique prevents extensive sacrifice of noninflamed tissues and apical displacement of the gingival margin. Thus, the root surfaces are not markedly exposed, and thus, the said method is considered good for esthetic reasons and useful in the anterior regions of the dentition. The patients were asked to use chlorhexidine gluconate (0.2%) rinse twice a day for 15 days, and no periodontal dressings were given in this case either as results from various clinical studies have suggested that a periodontal dressing might often be unnecessary or even undesirable after periodontal flap procedures and might be replaced by rinsing with chlorhexidine only as suggested in the study by Sanz et al. Furthermore, rinsing with chlorhexidine does not prevent the formation of plaque under the dressings as suggested in the study by Plüss et al. The results obtained in the present study with open flap debridement in terms of reduction in PD and gain in CAL values confirm the findings as reported in the studies conducted by Lindhe et al., Lindhe et al., and Sculean et al. For the laser-assisted pocket therapy, the reduction in PD and gain in CAL values were found to be consistent with those obtained in the studies of Moritz et al., Borrajo et al., Caruso et al., and Kamma et al. The changes seen with laser therapy might be attributed to the fact that due to the laser's ablation action, the epithelium lining the soft tissue walls of the pockets and the adjacent inflammatory cell infiltrates might have been removed. In addition, the low-dose radiation that scatters into the surrounding tissues might possess a beneficial effect on the healing process. Furthermore, laser therapy might have resulted in improved proliferation of the fibroblasts and their adhesion to the root surfaces, leading to CAL gain. There is less collagen remodeling, faster healing, and minimal scar tissue with laser-assisted pocket therapy, which might explain why less gingival recession takes place in the said situations. Diode lasers also have antimicrobial effects and detoxification properties. They have a high bactericidal potential against periodontal bacteria. The results of the present study were in contrast to the results obtained by Assaf et al. and Euzebio Alves et al., wherein the clinical and microbiological data with the high-intensity diode lasers did not show any additional benefits to the conventional periodontal treatment procedures. Furthermore, the American Academy of Periodontology, 2011, statement of laser for nonsurgical periodontal therapy says that lasers are not effective for laser curettage or bacterial reduction when used alone or as adjunct to scaling and root planing (not even by photodynamic therapy) as suggested by the study conducted by Cobb et al. There is a considerable conflict in results for both laboratory studies and clinical trials even when using the same laser wavelengths. The current evidence does suggest that the use of the diode, Nd: YAG, or Er: YAG lasers for the treatment of periodontitis might be equivalent to scaling and root planing with respect to reduction in the probing depth and subgingival bacterial populations. Gain in CALs, however, is considered the evidence supporting laser-assisted periodontal therapy over conventional therapy. Furthermore, in the present study, there was a statistically significant reduction in the number of CFUs of anaerobes in the laser-treated group as compared to the conventional open flap debridement group, and this could be attributed to the bactericidal effects of the diode lasers. The wavelength of the diode laser is absorbed by protohemin and protoporphyrin IX pigments of the pigmented anaerobic periodontopathogens, leading to vaporization of water, and lysis of the cell walls of the said microorganisms, leading to cell death. Diode lasers are also effective against the tissue invading periodontal pathogens due to the absorption of laser energy up to 2 ± 1 mm in the deeper tissues. The results of the present study showed significant differences between the laser-assisted periodontal therapy group-treated sites and the conventional open flap debridement group-treated sites with regard to reduction in the PD and the periodontal pathogens. 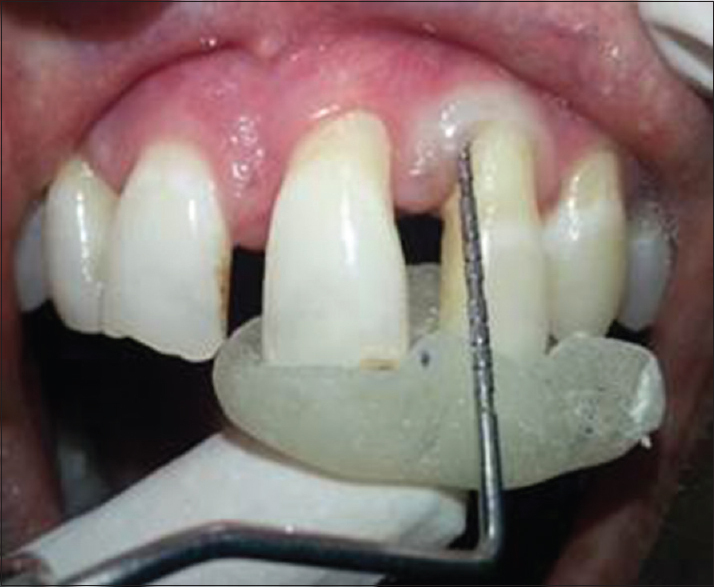 The greater pocket depth reduction in case of open flap debridement group might also be attributed to the higher amount of gingival recession seen postoperatively. 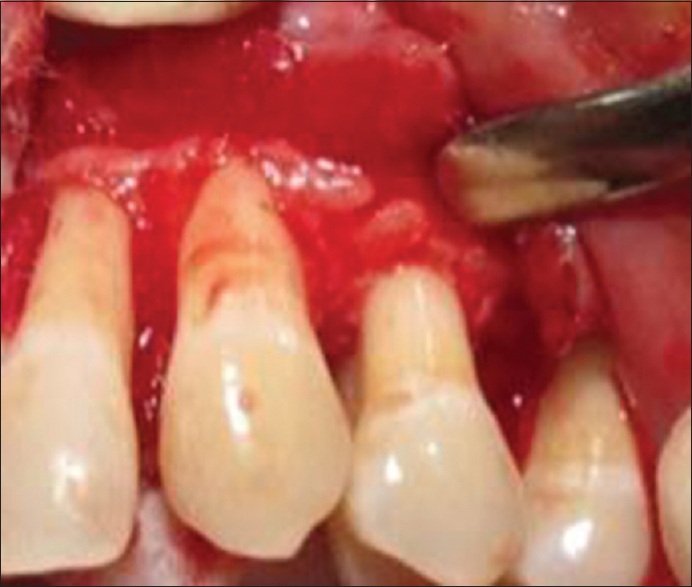 It can be assumed that although significant difference was found in terms of reduction of PD in favor of open flap debridement procedure, this was at the cost of gingival recession. It was also observed that laser-assisted periodontal therapy was far less invasive and less time-consuming than open flap debridement procedure and required almost no use of analgesia increasing patient compliance. 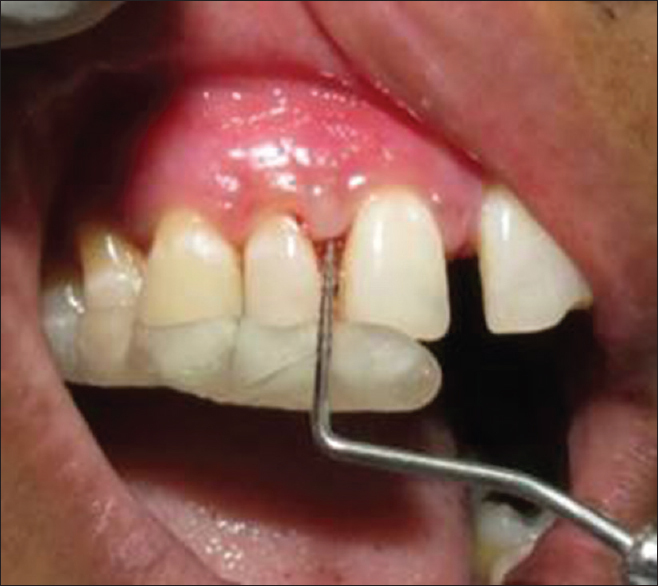 Furthermore, this treatment modality had no postoperative complications or impaired clinical healing, indicating that this type of laser treatment might not have any detrimental effect when used for periodontal therapy. 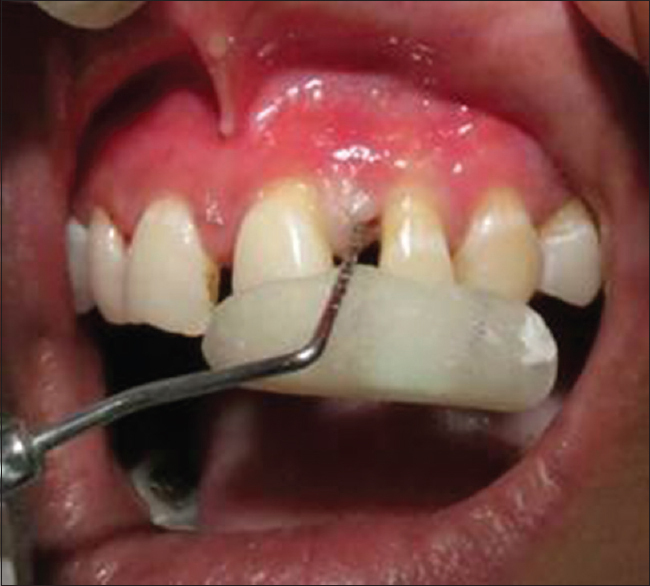 Gingival recession and bleeding index were also not taken into consideration. They would have further added the ability of the present study to assess and confirm the stability and sustainability of the clinical outcome postprocedurally. There was a statistically significant difference between the PD reduction in Group I and Group II after 3 months of the procedures, with a P = 0.02. Furthermore, the mean value of CFUs after 3 months of the procedures in Group I was significantly less as compared to Group II, with P value for P.g. being 0.017, for F.n. being 0.001, for A.a. being 0.000, and for streptococci being 0.006. Within the constraints of the present study, therefore, it could be concluded that lasers might be considered as an alternative to the surgical therapy for periodontal pockets, especially in anterior regions where aesthetics play a key role. In addition, laser-assisted pocket therapy seems to possess additional benefits in terms of having no need of analgesia, lesser mechanical trauma, lesser postoperative complications in the form of pain and swelling, and being a minimally invasive procedure with greater patient compliance, lesser procedural time, minimal bleeding, and additional antimicrobial effect. Ramfjord SP, Nissle RR. The modified Widman flap. J Periodontol 1974;45:601-7. Ramfjord SP. Present status of the modified Widman flap procedure. J Periodontol 1977;48:558-65. Kaldahl WB, Kalkwarf KL, Patil KD, Dyer JK, Bates RE Jr., Evaluation of four modalities of periodontal therapy. Mean probing depth, probing attachment level and recession changes. J Periodontol 1988;59:783-93. Schwarz F, Sculean A, Berakdar M, Georg T, Reich E, Becker J, et al. Clinical evaluation of an Er:YAG laser combined with scaling and root planing for non-surgical periodontal treatment. A controlled, prospective clinical study. J Clin Periodontol 2003;30:26-34. Aoki A, Sasaki KM, Watanabe H, Ishikawa I. Lasers in nonsurgical periodontal therapy. Periodontol 2000 2004;36:59-97. Gold SI, Vilardi MA. Pulsed laser beam effects on gingiva. J Clin Periodontol 1994;21:391-6. Crespi R, Barone A, Covani U. Histologic evaluation of three methods of periodontal root surface treatment in humans. J Periodontol 2005;76:476-81. Pick RM, Colvard MD. Current status of lasers in soft tissue dental surgery. J Periodontol 1993;64:589-602. Sculean A, Schwarz F, Berakdar M, Windisch P, Arweiler NB, Romanos GE, et al. Healing of intrabony defects following surgical treatment with or without an Er:YAG laser. J Clin Periodontol 2004;31:604-8. Dean DB. Concepts in laser periodontal therapy using the Er, Cr:YSGG laser. J Acad Dent Therap Stomatol 2005;10:285-90. Cobb CM, Low SB, Coluzzi DJ. Lasers and the treatment of chronic periodontitis. Dent Clin North Am 2010;54:35-53. Kreisler M, Al Haj H, Daubländer M, Götz H, Duschner H, Willershausen B, et al. Effect of diode laser irradiation on root surfaces in vitro. J Clin Laser Med Surg 2002;20:63-9. Moore WE, Moore LH, Ranney RR, Smibert RM, Burmeister JA, Schenkein HA, et al. The microflora of periodontal sites showing active destructive progression. J Clin Periodontol 1991;18:729-39. Socransky SS, Haffajee AD. Microbiological risk factors for destructive periodontal diseases. In: Risk Assessment in Dentistry. Chapel Hill: University of North Carolina, Department of Dental Ecology; 1990. p. 79. Lindhe J, Lang NP, Karring T. Clinical Periodontology and Implant Dentistry. 5th edition. UK: Wiley-Blackwell; 2008. Schwarz F, Sculean A, Georg T, Reich E. Periodontal treatment with an Er: YAG laser compared to scaling and root planing: A controlled clinical study. J Periodontol 2001;72:361-7. Gupta M, Lamba AK, Verma M, Faraz F, Tandon S, Chawla K, et al. Comparison of periodontal open flap debridement versus closed debridement with Er, Cr: YSGG laser. Aust Dent J 2013;58:41-9. Raffetto N. Lasers for initial periodontal therapy. Dent Clin North Am 2004;48:923-36, vii. Goldman HM, Cohen DW, eds. Periodontal therapy. 6th edition. St. Louis: CV Mosby; 1980. Kirkland O. The periodontal pocket: Its treatment by the modified flap operation. J Am Dent Asso 1931;18:1462-70. Sanz M, Newman MG, Anderson L, Matoska W, Otomo-Corgel J, Saltini C, et al. Clinical enhancement of post-periodontal surgical therapy by a 0.12% chlorhexidine gluconate mouthrinse. J Periodontol 1989;60:570-6. Plüss EM, Engelberger PR, Rateitschak KH. Effect of chlorhexidine on dental plaque formation under periodontal pack. J Clin Periodontol 1975;2:136-42. Loe H, Theilade E, Jensen SB. Experimental gingivitis in man. J Periodontol 1965;36:177-87. Borrajo JL, Varela LG, Castro GL, Rodríguez-Nuñez I, Torreira MG. Diode laser (980 nm) as adjunct to scaling and root planing. Photomed Laser Surg 2004;22:509-12. Caruso U, Nastri L, Piccolomini R, d'Ercole S, Mazza C, Guida L, et al. Use of diode laser 980 nm as adjunctive therapy in the treatment of chronic periodontitis. A randomized controlled clinical trial. New Microbiol 2008;31:513-8. Assaf M, Yilmaz S, Kuru B, Ipci SD, Noyun U, Kadir T, et al. Effect of the diode laser on bacteremia associated with dental ultrasonic scaling: A clinical and microbiological study. Photomed Laser Surg 2007;25:250-6. Euzebio Alves VT, de Andrade AK, Toaliar JM, Conde MC, Zezell DM, Cai S, et al. Clinical and microbiological evaluation of high intensity diode laser adjutant to non-surgical periodontal treatment: A 6-month clinical trial. Clin Oral Investig 2013;17:87-95. Theilade E. The non-specific theory in microbial etiology of inflammatory periodontal diseases. J Clin Periodontol 1986;13:905-11.